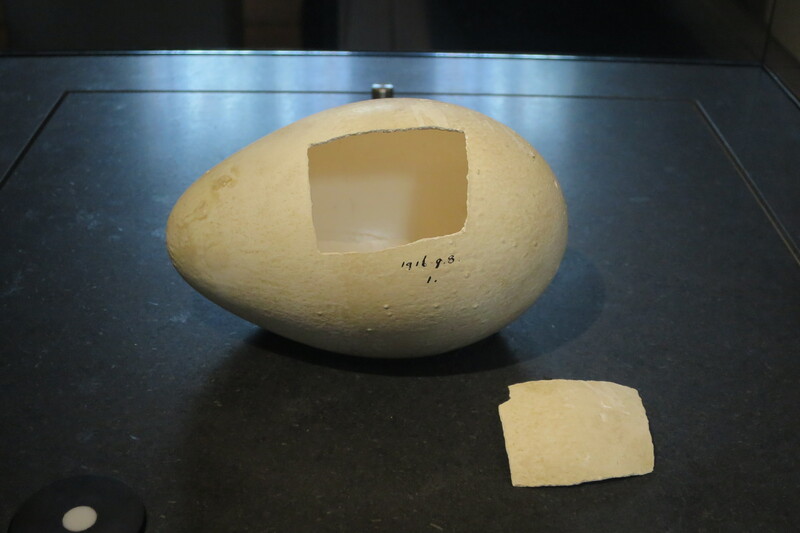 It’s no secret that I am a bit Antarctica Crazy, but when I walked into the Cadogan Gallery of London’s Natural History Museum and saw this egg, I suddenly felt very weak at the knees. Moments later I wanted to shout out to all the other visitors in the room ‘Look at this egg! Don’t you know how it got here?. People drifted past the other exhibits; a tray of pinned butterflies from Alfred Russell Wallace’s personal collection, the skeleton of a well and truly dead and extinct Dodo, the fossil of an Archaeopteryx, but finding the egg here was a complete surprise. The story of the egg is moving and tragic, and begins with Dr E.A. Wilson, Zoologist to Captain Scott’s Terra Nova South Pole Expedition. At the time it was believed that penguins were an evolutionarily primitive bird, and Wilson believed that by examining the developing embryos of Emperor Penguins, it would be possible to determine the evolutionary relationship between birds and reptiles. The problem was that the only known Emperor penguin rookery in the world, was at Cape Crozier, almost 70 miles from their Antarctic expedition base at Cape Evans, and that the eggs were laid in June, during the austral winter. Wilson persuaded Captain Scott that instead of whiling the winter away in their cozy hut, he should attempt to collect some specimens of penguin embryos for the purpose of scientific research. A party of three men, Edward Wilson (Bill), Henry Bowers (Birdie) and assistant zoologist to the expedition Apsley Cherry-Garrard, set off just after mid-winter on June 27th 1911, in search of the Cape Crozier penguin rookery. They were hauling two sledges carrying a total of 757lbs (343kg) in almost total darkness and in temperatures between -40F (-40C) and -50F (-60C). Friction on the runners of the two sledges made it almost impossible for the men to drag them, and they were forced to relay their load, taking first one sledge, then returning for the second, thus travelling three miles for every one mile gained. It took them 19 days to reach Cape Crozier, making slow progress in the darkness. 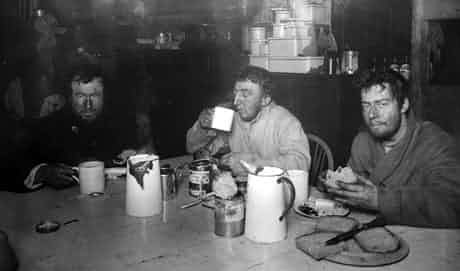 Their provisions consisted of pemmican, biscuit, butter and tea, and Scott had asked them to experiment with variations in diet, to determine the proportions best suited to such extreme conditions. Wilson’s daily ration had a larger proportion of fat and consisted of 8oz butter, 12oz pemmican and 12oz biscuit. Bowers rations concentrated on proteins with 16oz pemmican and 16oz biscuit , while Cherry-Garrard relied on carbohydrates with his ration of 20oz biscuit and 12oz pemmican. The terrain was treacherous in the darkness, and Cherry-Garrard, unable to wear his spectacles in such low temperatures, found it very difficult to see where he was going. Steering by planet Jupiter, they struggled through sand-like snow crystals, achieving only 2 1/4 miles in 8 hours on July 1st. Their sweat froze inside their clothes, and accumulated like armor plating, they shook snow and ice from the inside of their trousers every time they changed their footwear. They suffered from frostbites almost every day, which rapidly formed blisters on fingers and feet. The fluid inside the blisters froze and could only be drained after warming up inside the tent at night. It was so cold, that they began to feel that temperatures of -50F (-45C) were a luxury to be looked forward to. Their sleeping bags froze solid with the moisture from breath, sweat and cooking. It routinely took more than four hours to break camp in the mornings. The approach of blizzards caused the temperature to rise, on July 12th the temperature rose to +9F (-12C) with winds howling at Force 10; sleeping bags and clothes thawed but never dried out, and progress was prevented by high winds and snow. They could do nothing but wait for a change in the weather. Eventually, on July 15th they reached their goal some 800 feet up on the slopes of Mt Terror. Their plan was to build an igloo from rocks and boulders to use as a base for excursions to the rookery to collect eggs as well as penguins to use as fuel for their blubber stove; they had used more of their store of oil and paraffin on their journey than expected and wanted to save some for their way back. There was little moonlight or daylight, and Wilson and Bowers dug rocks by the light of a hurricane lamp while Cherry-Garrard set to building the walls. After two days, the walls were built but it was impossible to bank them with snow as it was frozen solid. A sheet of canvas, and one of the sledges was used as a roof, and great care was taken to construct a door from a plank brought especially for the purpose. They pitched their tent outside the igloo and filled it with their gear. On July 19th, the weather was looking good for an expedition down to Cape Crozier. They took one empty sledge, two ice-axes, Alpine rope and skinning tools, but it was soon clear to Wilson that the pressure ridges had changed in the ten years since he had last visited. They slithered across snow slopes, crawled along drift ridges and took turns to haul each other out of crevasses until they heard the call of the Emperor penguins, but, steep walls of battered ice blocked their way and they started back on their tracks while there was still light enough to see them by. Next morning at three a.m., they worked on the igloo, fixing the canvas roof with slabs of hard snow and rocks before setting off once again for the rookery. Wilson took the lead, harnessed to the sledge, with Bowers and Cherry-Garrard following in harness behind and, struggling again over ridges and slopes, they found their way, through a crack in the ice to a cliff some 12 feet above the penguins. It was decided that Cherry-Garrard would stay at the top of the cliff with the Alpine rope, to help the others back up on their return. There were only 100 penguins in the rookery, compared to over 2000 in 1902 and 1903. Nevertheless, five eggs were collected, and placed inside their mittens for protection. They also killed and skinned three penguins, each weighing up to six and a half stone (40kg). The journey back to camp was difficult, it was dark, and the weather was beginning to blow up again. With his poor eyesight, Cherry-Garrard found the going tough, and two of the precious eggs in Cherry-Garrard’s mitts smashed when he fell. Bowers put his foot through a crack into the sea, and it froze into a block of ice. They thought they had reached the lowest point of their journey, and that things would soon improve. They were wrong. Back in the igloo, the blubber stove spouted boiling oil into Bill’s eye, leaving him in agony and the belief that he would be permanently blinded. With their gear stashed inside the tent, they retired to the igloo to sleep. The wind began to blow ‘as though the world was having a fit of hysterics. The earth was torn in pieces; the indescribable fury and roar of it all cannot be imagined.’ (p292) Some time later they were woken by Bowers cries of ‘ Bill, Bill, the tent has gone’. Without the tent, a safe return to Cape Evans looked impossible. They discussed the possibility of digging a hole each night and covering it with a roof made of the floor cloth, which was all they had left. It seemed that without the tent, they were dead men. Bowers wrote ‘I was resolved to keep warm, and beneath my debris covering I paddled my feet and sang all the songs and hymns I knew to pass the time. I could occasionally thump Bill, and as he still moved I knew he was alive alright’ . Bowers recorded storm force 11 winds that night, and he was apt to underestimate. A little light rose in the sky, and feeling better after their meal, they once again set out to search for the tent. It was lying about half a mile away, having folded up like an umbrella, two of the poles were broken, but the silk was undamaged. The next day they packed the sledge, and left the second one with a note pinned to it. The return journey was no easier than the outward one. They were so tired that they slept while they ate and while they walked. They camped to escape the wind, huddled inside their sodden sleeping bags. On July 26th they became lost in a bunch of crevasses and camped with the sound of ‘ pressure pops all night ‘as though some one was whacking an empty tub’. Birdie went down a crevasse and hung from his harness as the others pulled him up using the Alpine rope. Gradually the sun began to creep towards the horizon giving more light each day. They managed to cover distances of six or seven miles compared to less than two on the way out and, spurred on by their progress, arrived back at Cape Evans after five long weeks of the hardest conditions they had ever recorded. It would be two more years before Apsley Cherry-Garrard, as custodian of the three remaining eggs, was able to deliver them to the Natural History Museum in South Kensington, London. 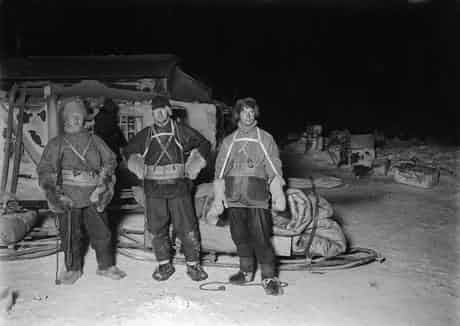 In the meantime, both Wilson and Bowers as part of the Polar Party, had accompanied Scott to the South Pole, only to find they had been beaten in the race by the Norwegian party led by Amundsen. It was a bitter disappointment to them. They died, side by side with Scott huddled in a tent as they waited for a blizzard to clear. In 1913 Cherry-Garrard arrived at the door of the NHM with the eggs. He was almost turned away at the door, but finally persuaded the doorman to let him in to speak to the ‘Chief Custodian’ of eggs. 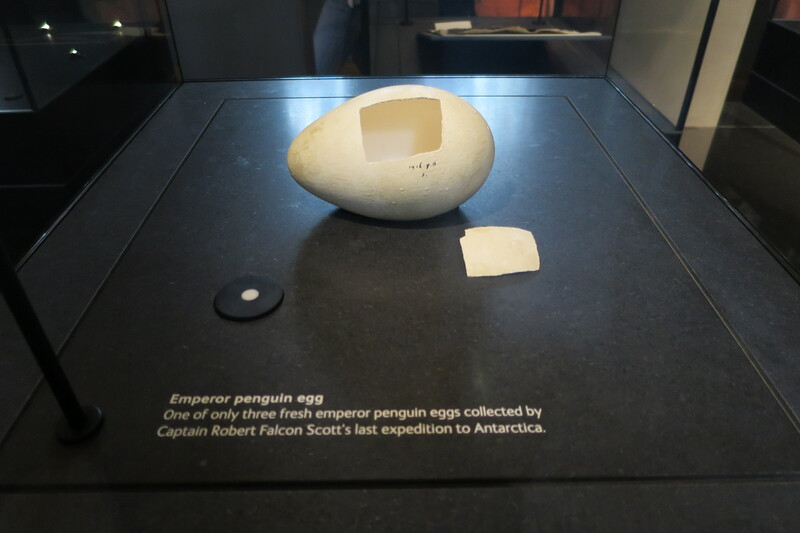 Some time later Cherry-Gerrard visited the NHM with Captain Scott’s sister, and they requested to see the penguin’s eggs, whereupon the ‘minor custodian’ insisted that no such eggs existed or were in their possession. The eggs had been entrusted to Professor Assheton for examination, but he had unfortunately died before he could study them. 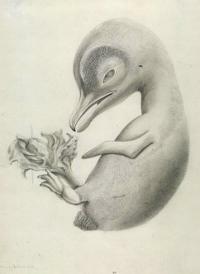 It was 1916, and penguin embryology was put on hold for the duration of the First World War, so it was not until 1934 that the full report was finally published by Professor Cossar Ewart of Edinburgh University. In the meantime, scientific theories had moved on, and ideas had changed. The eggs only proved that Wilson’s idea’s had been wrong. In the words of Cherry-Gerrard “three human lives had been risked three hundred times a day, and three human frames strained to the utmost extremity of human endurance” in the interest of scientific enquiry. Apsley Cherry-Garrard never really recovered from his experience in Antarctica, either mentally or physically. Today he would probably have been diagnosed with Post Traumatic Stress Disorder, and he required frequent dental treatment because his teeth had been shattered by the cold and shivering during the winter journey. He died in 1959. Treasures at the Cadogan Gallery of the Natural History Museum, London, features 22 objects from the museum’s 70m specimens, spanning 4.5 billion years of the Earth’s history. Each exhibit tells a remarkable story and has been chosen for its scientific, historical and cultural importance. Posted in Antarctica, Travel, WildlifeTagged Antarctica, Apsley Cherry-Garrard, Birdie Bowers, Cape Crozier, Cape Evans, Captain Robert Falcon Scott, E.A.Wilson, Emperor penguin, Natural History Museum London, NHM, penguin egg, penguin embryo, Ross Island, Terra Nova Expedition, The Worst Journey In the World, Treasures at the Cadogan Gallery, Winter journeyBookmark the permalink. I like learning something new when I take the time to read blog posts.